What a rewarding and memorable day! 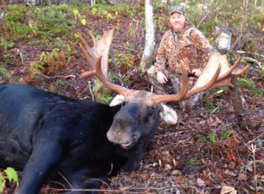 I harvested a 780 pound bull with a 53” spread after only 45 minutes into the hunt in Zone C1! My thanks to the NH Guide Services for their expertise, and to the Wildlife Heritage Foundation of NH for the opportunity to participate in the hunt and support the Foundation’s goals. 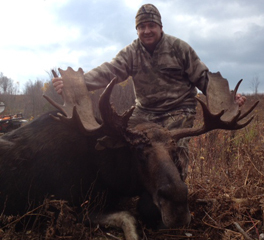 I t was a terrific hunt, and I successfully harvested an 800 pound bull with a massive 61” spread. Beautiful animal! Great job by the NH Guide Service, and my thanks to the Wildlife Heritage Foundation of NH for such a rewarding experience!” Photographer Michael Pestana is pictured with the moose. Enter your email address to subscribe to our website and receive notifications of updates by email. Duane Cross, Carol Weatherbee, John Green, Lindsay Webb, and NH Fish and Game Dept.